When I put on the supers earlier in the season, I was a little late and hoped that it would mean the colonies would delay any swarm ideas. I am not obsessive about swarming. Whe I did my course at MBBKA I remember the leader suggesting that he is always suspicious about people declaring they want non swarmy bees. The concept seemed to Frank as alien as seedless grapes. I went a way for a few days after and then, whilst miles away from home, suddenly realised I had forgotten to put on any Queen excluders. Rather than do a full inspection as the bee inspector was due shortly after I returned, I put in the excluders when I got home, fully expecting the queen to be in the super and laying. When Karen came and inspected I admitted my folly and she was thorough. The first hive showed no eggs or queen in the super and Karen observed the god of bees was smiling on me. I was pessimistic that I could be lucky a second time. In the first hive, too, there were capped queen cells. We didn’t see teh queen but Karen commented that if they had swarmed they had left a really good mass of bees behind. We removed all but 2 queen cells. At the second hive we found the god of bees really was being kind. Again no eggs in the super and a good healthy colony. In fact both colonies looked great. Karen suggested I consider using the drone brood removal method of helping in the varroa battle. I didn’t do an oxalic treatment this year which Karen said was probably wise because information about temperatures suggested bees were still laying over winter. The monitors we have at Hughenden Manor certainly indicated a steady 35 degrees in the brood area all over winter and I am close enough to assume that a similar pattern would exist in my own hives. For the last few years in my area there has been EFB reverberating around so I have had several visits from teh regional bee inspectors. I’d already arranged the latest visit from Karen before I had the news that there was now an outbreak of AFB locally. My heart sank but it seemed sensible to wait for karen to inspect as she knew what she was looking for much better than I. I believe some beekeepers are reluctant to register on Beebase but I cannot understand why. Every time a bee inspector comes I learn more even though I was trained and work with other beekeepers regularly. As well as information or reassurances passed on verbally, watching someone who is so expert is itself a reminder of best practice. I have developed some of my own preferences. I love the clear perspex quilts which Karen comments are good for beginners – am I still a beginner? It is 5 years since I had my first bees. I am still useless at seeing queens and just don’t feel like an expert. In most things in life, I have a sneaky feeling that the best thing is to believe you still have lots to learn. I hope it helps keep my brain in good order to carry on learning. I tend to normally have a water spray instead of a smoker though have a spray can of a dfferent product so that in the case of something untoward I have something more discouraging to hand. When I use a smoker I use some of the fuel pellets and sometimes add lavender to calm them. I try and visit the bees and just watch them at work so I hope I am reasonably in tune with what they are up to. My back is a real problem so I over winter my bees on just a single normal sized brood box rather than have the extra demands on my back. I have only lost one colony over winter – they lasted until march a winter or so back and then died. It was a year when the winter seemed to go on and on so I need to learn from that as I feel that is definitely a colony I should have saved. Today I am going to have a catch up. I started by reading some of my favourite blogs. Rusty’s wisdom is always worth considering and this one about how much honey to leave for the bees is up to her usual standard. When I was a kid, I never understood Chicken Little. I hated the way he ran around over reacting about something that wasn’t real. But this week, I knew exactly how he felt. We had weather that made me think the sky was falling in. Suddenly, all that I knew to be true in the world, those basic and inviolable laws of nature, were no longer. The world was completely upside down and it felt like anything could happen. It felt like the sky could fall in. When beekeepers go on holiday, I am afraid they look out for local bees and local honey as well as taking time to admore the scenery. The first time I spotted what I was convinced was a Swiss version of a bee house I was caught unawares and failed to take a photo. 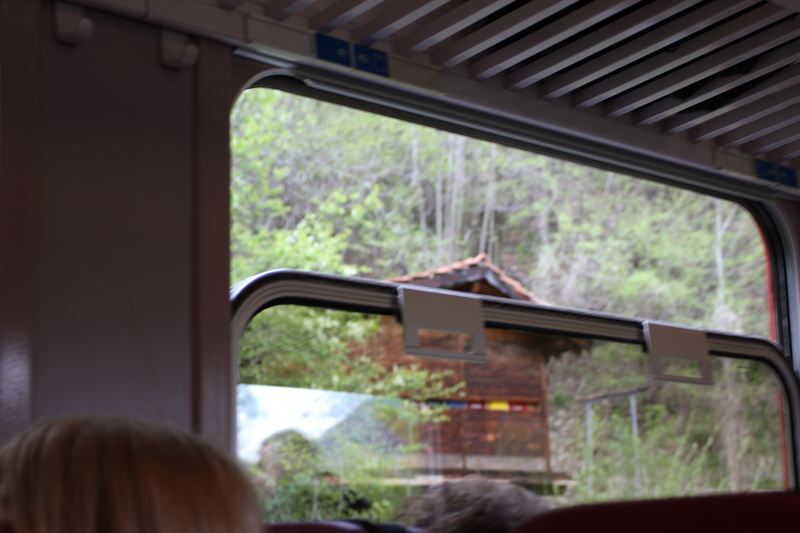 on subsequent occasions I managed to grab an image – but as I was moving past in a train the photo is not brilliant. What do you think? Is it a building for bee hives, with coloured entrances to avoid drifting? Or is there another explanation? If it is, does anyone know where there is a better picture? I have to admit that I have some concerns about my deduction, but it is odd that the ones I saw were so similar to each other. Whilst at first sight the building seem tall, they would need to be tall enough for the beekeepers to stand when they dealt with the bees.